Half the money I spend on advertising is wasted; the trouble is, I don’t know which half. – John Wanamaker (1838 – 1922). This statement, at the time it was first made back in the late 1800’s, echoed the sentiments of merchants and advertisers all around. Back then, advertising was less sophisticated – television ads, billboards and methods we consider “traditional” today. It’s next to impossible to measure the effectiveness of these methods. So many years have passed, and so many developments have been made in the world of marketing. Yet, in a world of digital marketing, where we have the ability to deeply analyze audiences and advertising performance metrics, it’s been said that 60% of digital marketing spend is being wasted. That’s more than the half Wanamaker had trouble with! To add insult to injury, more than 56% of ads are never seen by consumers and the popularity of ad-blocking software is increasing every year. And for those who actually see the ad, only 0.17% are clicking through. It’s enough to have advertisers quaking in their digital boots. How do you make sure that your budget is actually yielding you results and not being squandered away without you realizing? You start by taking advantage of the analytical tools available to fix what’s broken in your current system, then considering alternatives that might yield better results out of your advertising, whether it be within Google AdWords, Facebook, Instagram Ads, or any other digital platform. These may sound simple enough to obtain, but in large businesses with massive budgets, multiple advertising channels and sales and marketing teams operating separately, it might be harder to track than you think. Knowing these figures is the only way you’ll be able to tell if you’re getting the results you paid for or you’re wasting money. It can also tell you if the reason you’re not converting is due to the advertising returns, or something else. If you’re getting many leads but they’re not converting to customers, that might be an indication that you’re seeking the wrong type of customer or your sales team just isn’t doing a great job. If the amount that you’re spending to acquire customers through a certain channel is not significantly greater than what they’re worth to your company (customer lifetime value – cost to service them), then it might not be worth it to be advertising through that channel. To know for sure if it is worth it, you’ll have to do some further digging and testing to see if a different approach might help. According to the Bot Traffic Report released by network optimization firm Incapsula, a whopping 52.8% of web traffic in 2016 was attributed to bots. So if you want to know how many actual humans came to your site, you might want to cut your traffic figure in half. When it comes to AdWords or any other PPC (pay per click) platform, the bottom line and effectiveness of your budget can be significantly affected by bots and fraudulent activity. This non-human traffic can be hackers, spammers or scrapers, trying to get access to your site in some form or another. But it could also be your competitors hiring click farms to deplete your budget and get your ads removed from search engines. Whatever it is, one thing is for sure – whether malicious or not, you’re definitely paying for it. You won’t be able to completely remove bots from accessing your ads or your site. It’s one of the great equalizers of the digital world – they may be a nuisance but everyone has them. However, you can use click fraud detection services, such as ClickCease, to help you significantly reduce their effect on your ad budget. ClickCease tracks each and every click on your ad and uses their algorithm to determine which ones may be from bots. This could be due to a combination of factors such as blacklisted IPs, bad hosts and proxy servers, among other things. Once they’ve detected it, they block that traffic so they are no longer able to see or click your ads. Additionally, they file a refund claims report with Google Adwords every two months and provide you with a comprehensive report so you can see what’s happening with your site. If you’ve been using online advertising for some time, chances are you have a long list of keywords you have been targeting. You might think this is great. After all, the more keywords you’re targeting, the more people see your ad. But not in this case. It doesn’t matter if millions of people see your ad if none of them are interested in clicking through. So it’s time to go through your keyword list and ruthlessly cut out the ones that aren’t converting as they should. Step #1: Go to the keywords tab under your bloated campaign. Step #2: Download and save all of your keyword data (just to be safe). Step #3: View your campaign data for the past 3-6 months (I usually start with 6 months; if bloating still exists, I’ll reduce the window). Step #5: This will remove all of the keywords that have generated at least one conversion over the period selected in Step #3. Step #6: Select all of the remaining keywords and remove them. Step #7: Remove the filter from Step #4. What’s left is every keyword that produced a conversion within the timeframe you selected in Step #2 – your best keywords. Step #8: Using your updated keyword list, sort by cost per conversion (CPA) and eliminate any remaining keyword with a CPA that is 30% higher than your maximum target CPA. Another way to cut the bloat is to actively get rid of negative keywords – those that bring up your ad but you really don’t want them to. They may be irrelevant, such as coming up in a search for ‘Tila Tequila’ when you’re selling a tequila brand; or downright detrimental, like a London Tour company’s ad appearing when persons are searching for information about the recent London Bridge tragedy. To stay on top of negative keywords, you can use a combination of proactive tactics – actively identifying search terms based on common sense and experience – and reactive ones – using your search query tool to see what terms triggered your ad and blocking the ones that are inappropriate. Nothing grabs your audience’s attention like something that is highly relevant and applicable to them in the moment. Showing the right ads to people at the right place and the right time will net you far better results than static ones that could apply to just about anyone. You can use geo-targeted advertising to show different versions of your ads to persons in different locations or to prevent others outside of your geographic base from seeing it altogether. These can be as narrow as a zip code or as wide as an entire country. 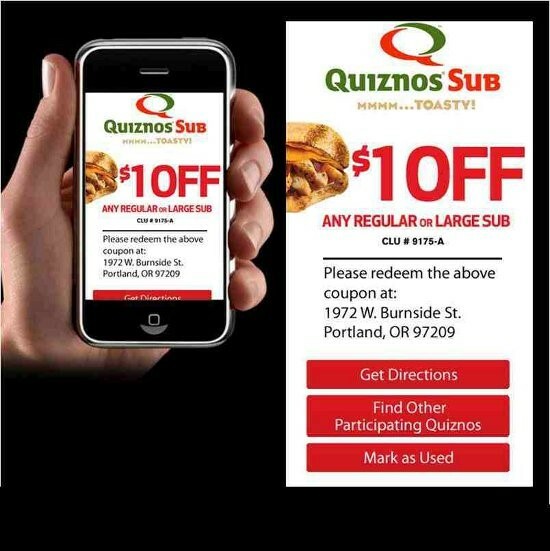 For example, take a look at how Quiznos used geo-targeting on mobile to offer a store- specific coupon to potential customers who are close by. If you’re thinking about where to have your next meal, this might just be the trigger that sends you to Quiznos over somewhere else. Also known as dayparting, you can use time-based advertising to minimize the appearance of ads during closing hours or show different offers based on what’s most likely to appeal to your customers at that time. For example, a coffee shop might want to focus on breakfast and coffee before 10 AM but push that they’re “open all night” after 10 PM. These take a bit of effort, but when they work, they work brilliantly! Just take a look at how Citi used different weather conditions to promote the same product. Are your customers more likely to click through on a desktop because they have to take a moment to peruse your offer? Or are they on-the-go and need instant gratification on their mobile device? As soon as you know which works best, reduce your ads on the other platforms or eliminate them altogether. Niche may sound like an overused buzzword at this point, but there’s a reason it’s on the tip of everyone’s tongue. It works. When it comes to getting your message out to your target audience via advertising, divide and conquer might be your best bet. Instead of trying to get an ad in a popular media outlet, which may be quite expensive and filled with your competitors, it might be better to seek out a few smaller publications, whether digital or otherwise, that target niche audiences, whom are also likely to be your customers. Not only is this typically a more cost-effective route, but you will have less competition in the smaller markets and you get to laser target your message and offer to this audience, instead of putting out a generic message that appeals to everyone. 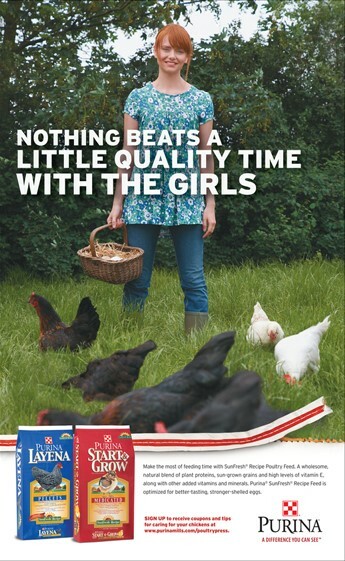 The ad below is one for Purina poultry feed. It’s perfect for a print ad in Farming Magazine, but it’s not the ad Purina would use if they were targeting readers of Housekeeping Magazine. There are many elements that go into making an ad successful – the copy, the landing page, the images, et cetera – and if you’re not optimizing each of them based on audience feedback, you’re not getting the best results you can. Most online marketers are familiar with A/B Testing, that is, putting out two very similar versions of something (in this case, your ad), except for one key difference, and seeing which performs best. You test any element of an ad, from pictures to words, even colors, but they key is to only change one at a time and see how that impacts your audience’s choices. One you’ve gotten your feedback, you eliminate the one that performed the worst and move on to another test, if you wish. 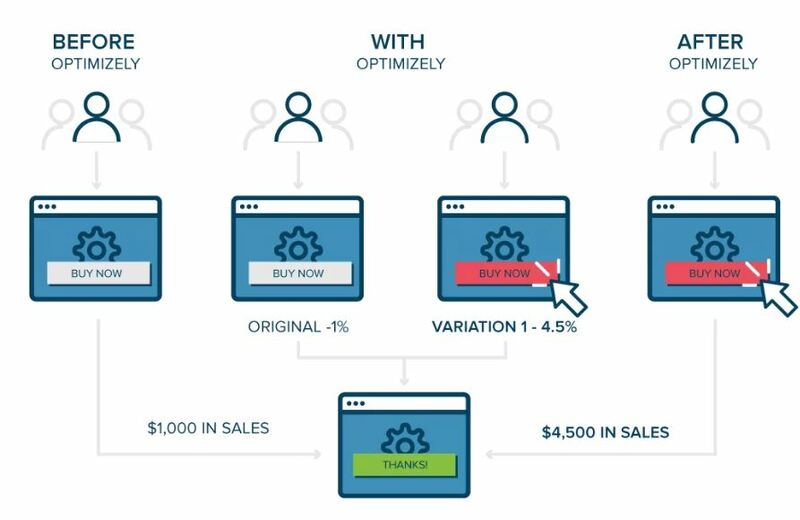 Additionally, landing pages – where your lead ends up once they click your ad – can be optimized with A/B testing with a tool like Optimizely. It’s important that these pages bear some resemblance to your ad, in terms of copy, offer or imagery, but you can always test out different approaches to layout, content and call-to-action to see what works best. 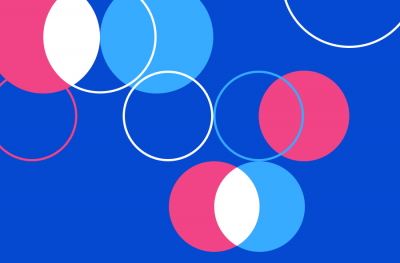 There’s a lot more to A/B testing than meets the eye, but subtle changes to content can make a huge difference in conversion rates, so it’s definitely worth looking into if you’re serious about making the most of your ad dollars. Because if you’re not testing, you’re guessing. When people think digital advertising, they immediately connect it with Google AdWords. And it makes sense – Google has managed to develop one of the largest, most prominent advertising platforms on the web, and they’ve made sure they are top of mind when you’re ready to spend. Yet, it’s very important that before you throw all your money at Google, you take a moment to break down your audience and learn about all your options for targeting them digitally. Here are a few platforms you might not have thought about before. While Facebook has lost its superiority and is no longer popular amongst the younger millennial and Gen Z crowd, it’s still very much a staple in the lives of Gen Xers. Additionally, Facebook allows you to choose your audience based on many demographic and sociographic factors that you won’t find anywhere else. Instagram is the more visual, younger, hipper child of Facebook. Literally, Facebook owns it. This means that not only do you have access to that millennial/Gen Z audience that’s not-so-active on Facebook, but you also get to use Facebook’s data-focused platform to do it. From Twitter to Instagram to YouTube, you have several persons making a living off creating entertaining or educational content strictly on social media platforms. These “social media stars” are the celebrities of the new generation and they attract a lot of attention through their pages, as demonstrated by their follower counts and engagement numbers. 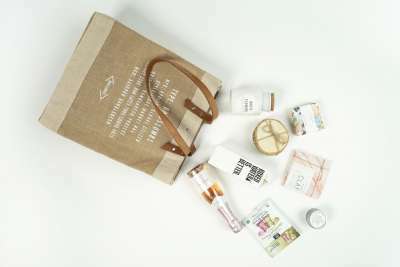 One of the ways they make money is by connecting with brands that want access to their audience and creating sponsored or branded content. Native advertising, put simply, is paid content that looks like the real deal, but it’s truly an advertisement in disguise. Online publishers like Buzzfeed have mastered the art of native advertising – seamlessly mixing in brand and product mentions into their highly-clickable articles. So much so that readers often don’t realize they are there. In a world of ad-blockers and general ad-blindness, this may be the way forward. Get in while you still can! If your products are the type that can be resold by multiple people in multiple ways without you being directly involved in the process – then getting affiliates or referrals might be the best way to save your advertising budget. Simply put, you create the collateral needed, seek out affiliates to promote your products for you, and you only pay them when they make a sale. Any paid advertising being done is mostly by them, so you don’t have to spend out of pocket. It’s not as easy as it sounds, but definitely worth trying out to see if works for you. 60% of your budget is a lot to lose, especially when the tools and opportunities are around to help you see where your money is being wasted and make better decisions. It’s time to leave behind the “set it and forget it” mentality and start actively analyzing your advertising results regularly and adjusting accordingly. Because if you’re not getting a return on your advertising spend, you might as well not advertise. Nadav is a veteran online marketer and the Founder & CEO of InboundJunction, an Israel-based content marketing company. Nadav helps well-known brands in boosting their online visibility through PR, SEO and Social Media.